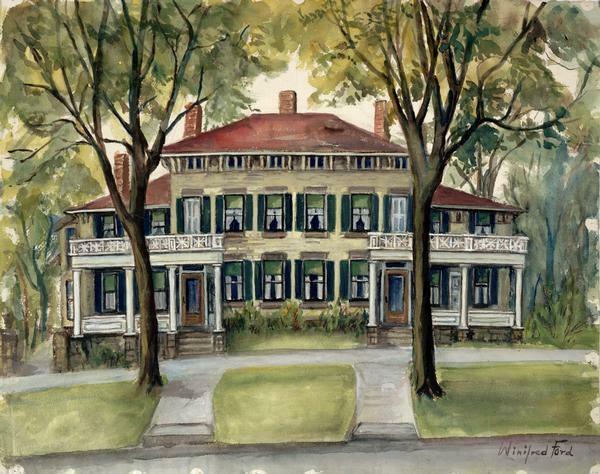 In 1938-39 Winifred Ford created more than 40 watercolors of historic Madison properties. The paintings documented residences, especially those owned by socially prominent people, as well as the old City Hall and several University of Wisconsin buildings. The Winifred Ford paintings in the Society's collections are realistic and detailed representations of these buildings — quite bold in treatment, using bright colors that have held up remarkably well. Since almost half of the buildings she depicted no longer exist, her paintings serve as an important architectural record. Although several paintings were donated by the families who bought the renderings of their homes from Mrs. Ford, 30 of them were apparently purchased from her by prominent Madisonians Mrs. Hobart (Elizabeth Hopkins) Johnson and Mrs. Lucien (Mary Esther Vilas) Hanks, who then donated them to the Society in January 1941. The watercolors were on display from April to June 1941 in the Historical Society Museum (then at 816 State Street), and were very popular with local residents. Winifred Bonnewitz (1876-1957) was born in Van Wert, Ohio, and as a young woman acted on Broadway for a while. She married Marcus C. Ford (1873-1941) in about 1904. The couple lived for 25 years in Kansas City and in 1933 moved to Madison, where Ford had spent his childhood. He graduated in 1897 from the University of Wisconsin with a law degree, but chose instead to live out his love of the theater as an actor, dramatic director, playwright and producer — especially for Haresfoot (the UW men's dramatic club). From 1935-37 Ford was state supervisor of drama and public speaking for the Federal Emergency Education Program under the Wisconsin WPA. After her husband died in 1941, Winifred worked as an artist and draftswoman in the engineering department of Gisholt Machine Company, then spent the last few years of her life in Atlantic City, New Jersey (where her son, Marcus Jr., worked in the entertainment industry). The Fords resided mainly at 10 East Gorham Street. Winifred later lived at 1023 Spaight Street. Both husband and wife are buried in Madison's Forest Hill Cemetery.